• Gendering Sufism: Tradition and transformation. This book will fascinate anyone interested in the challenges of contemporary Sufism as well as its relationship to Islam, gender, and the West. It offers an ideal starting point from which undergraduate and postgraduate students, teachers and lecturers can explore Sufism today. "A commendable research work, this volume is enhanced by it’s comprehensible text, lucidity, text-title relevance, and rich notes at the end of each chapter. 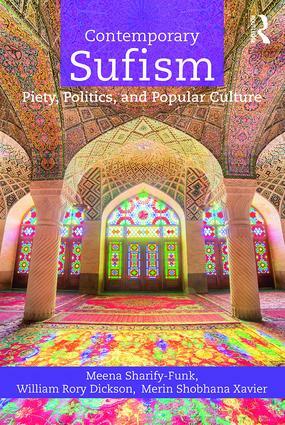 Contemporary Sufism: Piety, Politics, and Popular Culture is a must-read for students, researchers, and those with an expertise in religious studies, Islam, and Sufism and is highly recommended for the general readership as well." Mohammad Irfan Shah, Department of Islamic Studies at Aligarh Muslim University, Aligarh, India. Meena Sharify-Funk is Associate Professor and the Chair of the Religion and Culture Department at Wilfrid Laurier University, Canada. William Rory Dickson is Assistant Professor of Islamic Religion and Culture at the University of Winnipeg, Canada. Merin Shobhana Xavier is Assistant Professor in the Department of Philosophy and Religion at Ithaca College, USA.